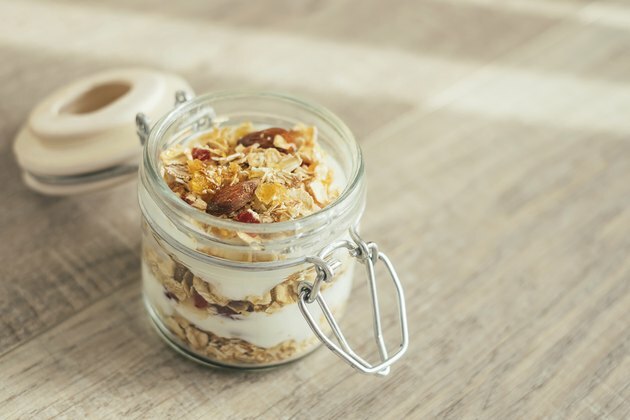 Muesli was invented in the early 1900s by a Swiss doctor named Maximilian Bircher-Benner, who was a leading member of the radical vegetarian and pro-nutrition societies of the day. Dr. Bircher-Benner believed that apples had cured him of jaundice, and extrapolated that a diet of muesli and fresh vegetables, with little or no meat, was the way to optimal health. There is no “official” muesli diet plan, but a muesli diet menu that includes plenty of vegetables, lean protein and exercise may help you lose weight and keep it off. Muesli has become a generic name for any cereal containing raw oats, dried fruits and nuts. It is available commercially packaged, in bulk at health food stores and organic markets. The original muesli was made mostly of grated apples, with a tablespoon of soaked oats, lemon juice, sweetened condensed milk and chopped nuts. Modern recipes such as the one offered by “Nourished Magazine,” have adapted and refined the original, which are made by combining rolled oats, apple or orange juice, yogurt, chopped dried fruit, nutmeg and cinnamon. Chill the oat mixture overnight and then garnish with grated Granny Smith apple, chopped almonds and melted butter. If you decide to add muesli to your diet, either make your own or choose a version that contains only natural ingredients. Artificial colors, sweeteners and preservatives defeat the purpose for which muesli was created. Dr. Bircher-Benner believed in the power of fresh fruits, vegetables and other natural foods to support and heal the body. Today’s experts, such as those at the American Heart Association, agree. A diet high in fresh fruits and vegetables and low in sugar and saturated fats can help you achieve and maintain a healthy weight. Replacing sugary cereals, trans fat-laden commercial pastries or fatty fast-food breakfasts with muesli will provide better nutrition and less fat, which will go a long way toward helping you lose weight. The rolled oats in muesli are high in fiber, which is necessary to a healthy body. According to nutrition experts at Colorado State University, fiber has possible benefits in treating constipation, diverticulosis and hemorrhoids, as well as encouraging healthy elimination. Combining the oats with the vitamin C in the apple or orange juice helps your body absorb the iron in the oats. The yogurt is a good source of calcium, and the dried fruits add fiber, vitamins, texture and flavor. The melted butter adds a little bit of necessary fat, but you can also leave that out to lower your intake of saturated fats. The nuts provide unsaturated fats, and if you add walnuts, they also have omega-3 fatty acids, which are heart-healthy fats. Starting your day with a bowl of muesli is an excellent way to kick-start a day of healthy eating. Your brain runs on glucose. According to Columbia University’s Health Q&A Internet Service, not eating from 10 p.m. or so until noon the next day robs your brain of the nutrients it needs to concentrate, solve problems and remember things. Skipping breakfast can also affect your mood. The high fiber in muesli should keep you full throughout the morning, helping you avoid the drive-through window or taco truck at lunch. Muesli is a nutritionally sound combination of foods, but it is not balanced enough to replace all of your other meals and snacks. Eating a diet of only muesli will not provide enough protein or the vitamins and minerals found in vegetables. Replacing breakfast and snacks with muesli is a good choice if you are trying to lose weight, but aside from not providing balanced nutrition, an all-muesli diet will not change the eating habits that put the weight on in the first place, and almost guarantees that you will put it all back on the minute you stop the diet.